Fit any floor plan and space with this Corliving TV stand. The black free standing TV stand can accommodate a television of any size up to 51-inch to 60-inch. Use this piece as a handy place to store movies, gaming consoles, and even speakers. Take your next movie or game night to the next level with the 50" Carson TV Stand. This stand is large enough to display your 50" flat-screen TV and offers plenty of storage space for various media items. Use the closed cabinets to hide gaming equipment and your DVD collection, and take advantage of the large open shelf to store AV components. A sleek espresso finish adds style to this practical piece to enhance your living room and help your interior design shine. Enhance the look of your living space with the contemporary styling of this art deco inspired TV stand. Constructed with thick panels in a brilliant white finish, this stand features open concept shelving and a storage drawer ideal for media storage solutions. This stand will accommodate up to a 47" flat panel TV. 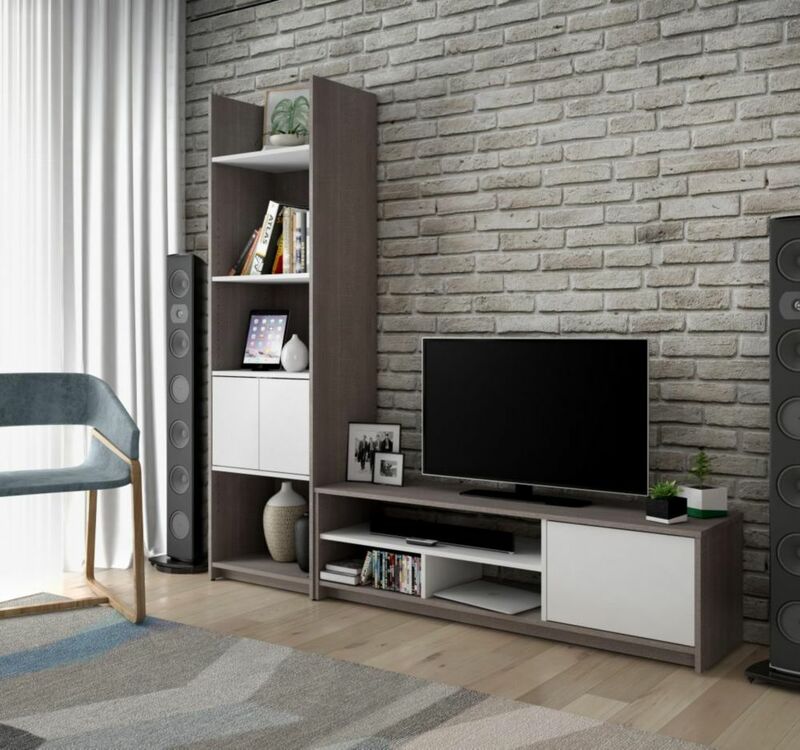 Small Space 2-Piece TV Stand and Storage Tower Set - Bark Gray & White Within a compact space, choosing the right pieces of furniture is crucial in order to feel relaxed and comfortable. Maximize every square foot of your room with Bestar's Small Space units! This set includes one 53.5-inch TV Stand and one 20-inch Storage Tower. 53.5-inch TV Stand: 53.5 inch W x 14.5 inch D x 15.1 inch H. Durable commercial grade top surface with melamine finish that resists scratches, stains and burns. 3 open compartments to keep you organized. 1 closed compartment with 1 adjustable shelf and 2 grommets for efficient wire management. 20-inch Storage Tower: 20 inch W x 14.5 inch D x 71.1 inch H. It features 2 fixed and 3 adjustable shelves. The top and the bottom shelves are fixed. The doors can be installed between 2 of the 3 adjustable shelves for a unique design. Assembly Required.